The destruction of the places of worship, religious conversion and the introduction of the Portuguese language failed to extinguish the national sprit among the Sinhala people and the Tamil people. Buddhism and Hinduism continued their hold on the people on the Sinhala and Tamil people. Similarly Sinhala and Tamil continued their hold on the majority of the respective people. Sinhalese of Sri Lanka are primarily Theravada Buddhists while Tamils are Saivaites, worshipers of Siva. Portuguese rule did not shake their faith in their respective religions. The most significant impact of Portuguese rule of Kotte and Jaffna on the Sinhalese and the Tamils was the penetration of Roman Catholicism deep into the Sinhala and Tamil societies, especially on the people who lived in the coastal belt. In these areas Roman Catholicism had become part and parcel of the lives of the people. The bond Roman Catholicism had built with the people of these areas was demonstrated when Roman Catholics were forcibly converted by the Dutch to Protestantism. They returned to their former faith with the ousting of the Dutch by the British. … national spirit of aspirations; a devotion to the interests of one’s own nation, a desire for national advancement or independence; the policy of asserting the interests of a nation; viewed as separate from the interests of other nations or common interests of all nations. A common language, culture and religion. In the long history of Sri Lanka, the Sinhalese people and the Tamil people have lived in separate territories: the Sinhalese in the west, south and the central regions; and the Tamils in the north and east. They have also governed themselves as separate units according to their customary laws. We have provided in the earlier chapters evidence for this position. Their separate territories and identities were maintained by the colonial rulers till 1833. In the earlier chapters we have also pointed out that the Tamils who had settled down in the north and the east since the pre-Christian era had grown into a full-fledged nation during the period of the Kingdom of Jaffna. They had a well-defined territorial area. They had also ceased looking back to Tamil Nadu which they earlier considered their motherland. They had emerged as a political entity with sovereignty which they protected from the Sinhalese. They proceeded to develop their social and cultural institutions and their agricultural and economic policies to suit their environment. By the time of the Portuguese invasion the Tamils have developed their distinctive identity. Sinhalese have ruled the north and east and the Tamils have ruled the south or parts of it during brief periods. In the history of the nations such conquests do happen. That does not give any conquering race or nation a permanent right to the conquered territory. Sampumal Kumaraya’s (Senpaga Perumal’s) 17-year rule of the Jaffna kingdom did not turn Jaffna into a Sinhala territory. The Sinhalese army stationed by Sapumal Kumaraya was driven away and Jaffna Kingdom continued to flourish till the Portuguese defeated Sankili. Evidence of Sinhalese settlements in specific sites like Kantharodai or Vallipuram does not make the Jaffna peninsula a Sinhala territory. Nor does the discovery that Tamil villages existed in and around Anuradhapura make that historic city a Tamil territory. Tamil and Sinhala histories have accepted the existence of Sinhala settlements in Tamil territories and Tamil settlements in Sinhala regions. Apart from living in separate territories, the Sinhalese people and the Tamil people had separate histories. The glorious Anuradhapura kingdom was the heritage of the Sinhala people. They are justified in being proud of it. They are also justified in entertaining a grouse against the Cholas for destroying it. Tamils are also justified in being proud of the Jaffna Kingdom which existed for over 400 years. They are also proud about its expansion up to Trincomalee in the east, Matale in the centre and Chilaw in the west. Tamils had controlled Matale for several years. The Sinhalese people and the Tamil people are equally proud that their ancestors resisted the Portuguese invaders. As hinted in the last Chapter, the most important outcome of the Portuguese invasion was the emergence of national sprit and pride among the Tamils and Sinhalese. Both communities resisted the Portuguese invasion separately and jointly. Separately, Sankili of Jaffna and Mayadunne and Rajasimha I of Sitavake, Vimala Dharma Suriya I, Senarat, Rajasimha II and Kirthi Siri Rajasimha of Kandy inspired the national spirit of resistance to foreign rule and they attained the status of folk heroes. This national spirit was the driving force for the revolts the Portuguese faced in their initial years in Kotte and Jaffna. The Portuguese faced six major and two minor revolts in Kotte. Two of the major revolts took place while Dharmapala was alive, one led by Akaragama Appuhamy in 1594 and the other by Edirille Rala in 1594-96. Four major revolts took place during the two decades following Dharmapala’s death. They were – those of Kangara Arachchi in 1603, Kuruvita Rala in 1603 and then 1616-19 and Nikapitiye Bandara in 1616-1617.There were minor revolts in the Seven Korales in 1616 and in Matara disavany in 1619. In Jaffna, the resistance continued till February 11, 1621. The first was soon after it was captured and the Portuguese army chief Captain Major Fillippe de Oliveriva was installed as the ruler of the Jaffna kingdom. The Karava chieftain who led the attack was beaten back. In March that year another Karava Chieftain, Sinna Meegampillai Arachie who earlier joined the Portuguese and was baptized as Dom Luis turned against them and obtained assistance from Ragunatha Nayakar of Thanjavur. His forces laid siege to Nallur but were beaten back by a detachment sent from Colombo. His second attempt with the help of about 2000 soldiers also failed because the Portuguese who got prior information met the invading force in mid-sea and drove them away. The final attempt to drive away the Portuguese was made in December by a force led by Varuna Kulatan. His force landed at Thondamanaru on December 5, 1620 and fought till February 11, 1621. With his defeat the rich and valiant history of Tamil resistance to foreign rule came to an end. There were several joint efforts by Jaffna, Sitavake and Kandy rulers to drive the Portuguese away. Sankili sent a detachment of his army to fight along with the Sinhala army led by Mayadunne and Rajasimha I. Sankili welcomed Vidya Bandara who fled to Nallur after he fell out with Dharmapala Bandaram. The resistance of the Jaffna kings and people inspired the Sinhalese and the heroic deeds of the Sinhalese, especially the guerilla attacks of the Kandyan kings inspired the Tamils, especially those of Vanni. Pandara Vanniyan conducted similar guerilla attacks against the Dutch. The Jaffna Kingdom consistently assisted the wars the Kandyan Kingdom fought with the Portuguese. South Indian assistance to the Kandyans flowed through Jaffna. The fall of Jaffna in 1619 was a great loss to the Kandyans. They lost the bridgehead through which they received supplies from South India. Though the Portuguese suppressed the revolts the people, and converted them to Roman Catholicism the Sinhalese and Tamils continued their social and cultural practices on the sly. The orthodox families migrated to safer places; Sinhalese to the Kandyan areas and the Tamils to Tamil Nadu. Among the Tamils, entire villages left the northern region. Sinhala literary output surged during the time of the Kandyan resistance. Tamil literary renaissance was the outcome of Sapumal Kumaraya’s short lived Jaffna rule. Tamil Sangam on the lines of the historic Madurai Tamil Sangams and a library, Saraswathy Mahal, was established on the lines of the Thanjavur library. Works on medicine and astrology and translations of Sanskrit literary works appeared. Tamil language was highly developed during the period of the Jaffna Kingdom and Savaism was adopted as the state religion. Jaffna kings promoted Tamil- Saiva culture. The kings patronized the temples. A similar development took place among the Sinhalese, especially in the Kandyan Kingdom. Sinhala- Buddhist culture evolved. The homogeneity of the people in the Sinhala and Tamil territories and the patronage of the rulers made religion and language the binding forces of each community: Buddhism and Sinhala in the Sinhala region; Hinduism and Tamil in the Tamil region. When the Portuguese arrived in 1505 the national aspiration of the respective people was to maintain their identity and sovereignty. When the Portuguese took over the administration of the Kotte and Jaffna Kingdoms their main concerns were trade and religious conversion. They gave priority to religious conversion over trade. Portuguese were Roman Catholics. They had captured Goa in the western coast of India in 1510 and had established their headquarters there. Catholic missionaries from Goa commenced their activities in Kotte and Jaffna soon after their arrival. Historian Prof. Tikri Abeysinghe says that the Portuguese were harsher in implementing their religious conversion policy in Jaffna than in Kotte. The Portuguese were soft to the Sinhalese because of the violent opposition Sitavake kings Mayadunne and his son Rajasimha I and the Kandyan monarch Vimala Dharma Suriya showed and the appearance of the Dutch on the scene. They had to adopt a mellowed approach towards the Sinhalese. There they promoted voluntary conversion, not the methods of compulsion they used in Jaffna. In Kotte, rewards, honour and advantage were held out as inducements to attract converts. They were assured of preferential treatment under the law and exceptions were granted from certain taxes. Roman Catholics were regarded as a privileged group. As Roman Catholicism was the religion of the rulers it had potent appeal to those in the higher groups of the Sinhala hierarchy like those of noble lineage and landowners. They opted to change their religion rather than lose their privileges. The new religion gave the people at the lower rungs of the caste ladder new status and dignity which their religion denied them. Senaka Weeraratna in his paper, "Repression of Buddhism in Sri Lanka by the Portuguese," says that the Portuguese used (a) a Carrot and Stick policy and (a) Enactment of Harsh laws to convert the people in Kotte and Jaffna to Catholicism. The carrot and stick policy involved the appointment of the converts to government posts and the admission of their children to schools. Laws involved stoppage of the public practice of non- Christian religions: Buddhism, Hinduism and Islam. Those laws were backed by a number of decrees designed to favour converts to Christianity. c) Conversion of non-Christians into Christianity must not be made by force, for nobody comes to Christ by faith unless he is drawn by the love of God. • Christians should be forbidden to live together or lodge with non – Christians. Consequently, Buddhist viharas were destroyed. Only four Buddhist priests were left alive in the Kotte kingdom. Catholic churches with schools attached to them were started all over the low country. They also opened colleges for higher education. The Portuguese education system provided the males primary and secondary education and the females primary education only. Kotte had 56 schools when Portuguese rule ended. The students were taught reading, writing and arithmetic and most of the teachers were Catholic priests. In the secondary schools, languages like Portuguese, Arabic, Greek and Latin were also taught. The Portuguese language spread extensively, and the upper classes quickly gained proficiency in it. It became the lingua franca of the trading community who occupied the coastal belts of Sri Lanka and India. In Jaffna the situation was different. Franciscan friars entered the Jaffna Kingdom soon after the Portuguese invasion of Jaffna in November 1591. They were aggressive in spreading their religion. They were also hostile to Hinduism. According to Portuguese records, they used the extensive powers of patronage and preference the Portuguese officials enjoyed in granting appointments and promotions to the Hindus to promote Christianity. They took action to convert the influential local administrators, mudaliyars to the village headman. Land-owning aristocracy was the other group that was compelled to adopt Roman Catholicism. Members of the Jesuit order entered Jaffna in 1622 and founded a college and used it as their headquarters. The Portuguese administrators decided the next year to divide the Jaffna peninsula into 42 parishes and allocated 24 to the Franciscans and the balance to the Jesuits. They sent the solitary Dominican who was already working in Jaffna to Kotte where others of his order had already established their presence. By 1634, all the parishes in Jaffna were functional. Abeysinghe who studied the Portuguese documents that reported the conversions in Jaffna says that in the period 1624-1626, the Franciscans alone converted 52,000 Jaffna Tamils. "According to detailed statistics furnished in Friar Paulo da Trinidade's work, there were in Jaffna in 1634, over 70,000 adult Christians and children being instructed in the faith under 25 parishes of the Franciscans alone. Taking that figure as a rough basis for the calculation of the total number of Christians in Jaffna under the care of the 42 parishes, one gets the figure 115,000." Antonio Bocarro's report of 1634 states that in Jaffna, "nearly all natives are Christians". Fernao de Queiros, the renowned Portuguese chronicler of Ceylon had described Jaffna as being "wholly Christian". Abeysinghe said the Brahmins, the Hindu priests, too were compelled to embrace Roman Catholicism. Most of them fled to Tamil Nadu, mainly to Ramanathapuram and orthodox Hindus also migrated to Tamil Nadu. Some families migrated to Vanni. When the Dutch conquered Jaffna in 1648, several villages in Jaffna were deserted. The Portuguese in their zeal to convert the entire Tamil population under their rule carried out general baptisms and mass conversions. Abeysinghe, quoting Portuguese officials Trinidade and Queiros says that a general baptism in a village was conducted thus: the arrival of the Portuguese missionaries was announced by the traditional tom tom beaters. When the people assembled, the Portuguese missionaries asked them to reject the "false" gods they were worshiping and accept "one true God". Abeysinghe adds that that was not a request but a command backed by the authority of the Portuguese government for the priests would invariably be accompanied by the local Portuguese officials and the native chiefs. "Fear of a fine or corporal punishment with cane and stock would ensure their regular attendance at church on Sundays and feast days," Abeysinghe adds. While concentrating on religious conversion the Portuguese also destroyed every Hindu temple and the Saraswathy Mahal library, the royal repository of all literary output of the kingdom. The first to suffer was the historic Thiruketheeswaram temple of Mannar. The rocks and bricks obtained from that temple were used to build the fort in Mannar. Nallur Kanthaswamy temple suffered next. Jaffna Fort was built using the building material obtained from it. Filipede Olivira, the Captain General of Jaffna (1619- 1627) is said to have boasted of having destroyed about 500 temples. Historians have found evidence that the original temple was built in 1248 in Kurukkal Valavu in Nallur, the same location the temple now stands. Nallur was then the capital of the Jaffna Kingdom. It was destroyed by Sapumal Kumaraya when he captured the Jaffna Kingdom in 1450 after destroying Nallur. According to Prof. S. Pathmanathan he repented his mistake and built a new temple in 1467 at a nearby location. The Portuguese General Phillip Oliviera destroyed the Nallur temple soon after he captured Jaffna and used the building material to build the Jaffna Fort. The new temple was built in the same place in Kurukkal Valavu, the place where the original temple stood. The Portuguese emphasis on proselytization spurred the development and standardization of educational institutions. Mission schools were opened as a means of conversion where the medium of instruction was Portuguese and Tamil. The Franciscans founded 25 parish schools and the Jesuits 12. They also established colleges for higher education in the Jaffna peninsula. In these schools religion, good manners (viores), reading, writing, arithmetic, singing, and Latin were taught. Education was free. Thus, like in Kotte in Jaffna also Portuguese became not only the language of the upper classes but also the lingua franca of prominence. The 140-year Dutch rule (1658- 1798) too failed to shake the faith of the Sinhalese and the Tamils had in their religion and language. The Dutch who ousted the Portuguese in 1658 were staunch Protestants. Their country Holland supported the Dutch Reformed Church and the Dutch East India Company (VOC) promoted the spread of the Protestant religion in Kotte and Jaffna. The Dutch implemented their religious policy rigourously in Jaffna. When the Dutch took control of Jaffna there were 26 Catholic churches and about 50 Roman Catholic priests. The Dutch either converted the Roman Catholic Churches into Protestant churches or destroyed them. They banished the Catholic priests, and declared giving shelter to Catholics, Buddhists and Hindus a capital offence. Buddhist and Hindu ceremonies too were prohibited. The Dutch were hard on the Roman Catholics because they feared that they would aid the Portuguese to recapture Sri Lanka. They also feared that unless the Roman Catholics were converted to the ‘true religion’ of Protestantism (Calvinism) they would fall back to their original religions of Buddhism and Hinduism. When the Dutch captured the peninsula there were 34 Hindu temples which escaped the Portuguese frenzy of destruction. They destroyed them. They banned all forms of Hindu practices. The Dutch built several churches in Jaffna. One of the Dutch churches, which was built within the Dutch fort of Jaffna stood there intact till the beginning of the 1990s and fell into ruins together with the fort due to heavy fighting around this area. The Catholics sought refuge in Madhu, the spot in the middle of the jungle where Sankili had executed 600 Catholic converts. To this spot they took the statue of Our Lady which was enshrined in a new church. Madhu thus developed into an important centre of pilgrimage for the Roman Catholics. Catholic priests also sought refuge in the Kandyan kingdom where religious tolerance existed. Others while professing Protestantism continued to practice Catholicism on the sly. This was especially so among the people who lived in the coastal belt. 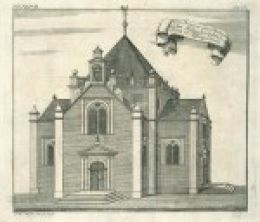 The Dutch churches were well proportioned and had characteristic gables. A few of them still exist. 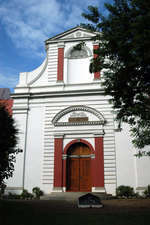 The Wolvendaal Church in Colombo, built in 1750, was the main place of Dutch worship. The Dutch replaced the Catholic parish schools established during the Portuguese period with schools affiliated with the Dutch Reformed Church. Education was almost entirely in the hands of the priests. The schools taught scripture and prayer, as well as reading and writing in Tamil; each school had from two to four teachers, all of them Catechist. The schools admitted only those who embraced Christianity. The rise in school attendance during the Dutch period is impressive. In 1665, seven years after the Dutch occupation the number of students enrolled in the Jaffna peninsula was about 10,000. By 1736 it had risen to 35,963. This shows that under the Dutch educational activity had become broadbased in the Tamil society. The emphasis the Dutch gave to education and to the use of Sinhala and Tamil generated the necessary environment for literary activity. That was particularly so in Jaffna, Vanni and Kandy where the nationalist spirit was steadily flourishing. The Dutch, unlike the Portuguese, did not have sufficient means to thoroughly convert the Hindus to Christianity and to supervise the converts. Yet the statistics of baptized Christians appears impressive. In 1716, almost fifty years after the Dutch occupation, the Christian population in the Tamil district was 73,412 persons. In the next six years it rose to 139,388 persons. By 1760 the figure was 182,266 Tamil Christians. The Dutch were more liberal during the second half of their rule. They permitted the rebuilding of some of the Roman Catholic churches and the construction and reconstruction of the Hindu temples. The Ceylon Gazetteer, a publication by Simon Casie Chitty, had reported that the Hindu religion had regained its predominance in Point Pedro and Roman Catholics too had their places of worship. St. Mary’s Church, Jaffna was built during the last decade of the Seventeenth Century. By 1814 there were 329 Hindu temples in Jaffna peninsula, many of them had come up in the first few years of British rule. A study by Richard Lovett (The History of the London Missionary Society (1795- 1895), Oxford University Press Warehouse, 1899 p 20, quoted by Bishop Dr. S. Jebanesan in The American Mission Seminary (1823-1855) p 14.) into the causes that led the Dutch to relax their religious policy revealed that they did so because they realized that the people “nominally professed Christianity while in their private lives adhered to their traditional religious practices”. That happened because the Dutch who during the early stage of their rule used compulsion to effect religious conversion had failed to convince the converts why their new religion was better. The Dutch Reformed Church did not have a sufficient number of clergymen to undertake that task and they did not make an effort to attain proficiency in Tamil. The Portuguese, on the other hand, were able to hold on the converts to Roman Catholicism because they got their converts involved in their new religion. In the closing years of the Dutch the number of Christians began to decline and the Christians who reverted to Hinduism restored the temples. According to the reports available new temples were built and the people celebrated the major festival with enthusiasm. With the British occupation of Sri Lanka in 1796 the Catholics who were converted to Protestantism returned to their old faith and the Hindus to their religion. By 1802, it was reported that most of the Hindus in Jaffna who were converted to Protestantism had returned to their old faith. After an external pressure weighing down the people for ages and drying up their spirits, was removed by their being brought under British rule, they believed not for joy that they were once more allowed to taste the sweets of idolatrous liberty. But on finding that it was even so, there was a mighty rush from a nominal Christianity to the all-embracing system of Hindu idolatry and they entered a course of temple-building and adornments wholly unparalleled in the annals of the province and which is in various stages of progress at the present time. Such was the state of things on our arrival in the year 1816.